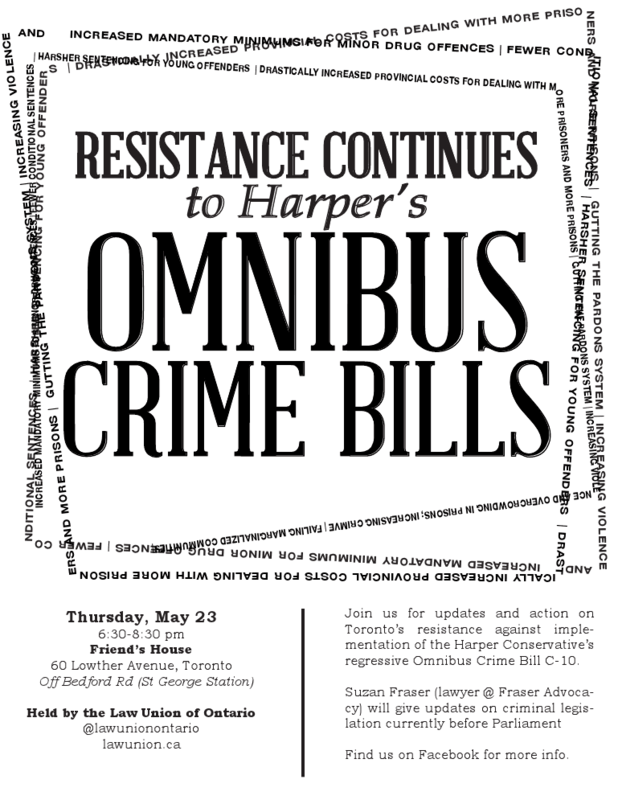 In March 2012, the federal Conservatives passed the Omnibus Crime Bill C-10, despite the protests of thousands of Canadians that the bill would greatly increase the prison population, would not prevent crime, would cost billions of dollars and would have a devastating impact on already marginalized communities, particularly Aboriginal communities who are already drastically over-represented in Canadian prisons. On January 17th, the Law Union of Ontario hosted a community meeting to brainstorm ways to prevent the implementation of the omnibus crime bill and stop Harper’s unjust law and order agenda. Please join up for an important follow-up meeting, for updates and action to further the resistance. Suzan Fraser (lawyer): an update on Bill C-54, and its implications for prisoners. There will time to work together to brainstorm next steps. ASL and child care will be available. Please email esmondej@hotmail.com by May 17th if you require these services.